DENPASAR. Sculpture and various types of souvenirs made from raw wooden creativity of Balinese artists most widely absorbed the United States market. Sales to Uncle Sam’s country accounted for 24.02% of Bali’s total export value of US $ 4.41 million during October 2017. “After the US, following the Australian market that holds 7.41% and Japan 2.85%,” said Head of Distribution Statistics BPS Bali I Gede Nyoman Subadri, in Denpasar, Tuesday (19/12). He said the artwork hand-made by Balinese artisans and craftsmen is also absorbed by the Singapore market 2.83%, China 0.60%, Hong Kong 0.62%, Thailand 1.14%, Germany 3.56%, and Netherlands 4.16%. The remaining 52.81% is absorbed by various other countries in the world, because the sculpture and various types of wood-based souvenirs are in great demand from people from various countries around the world. 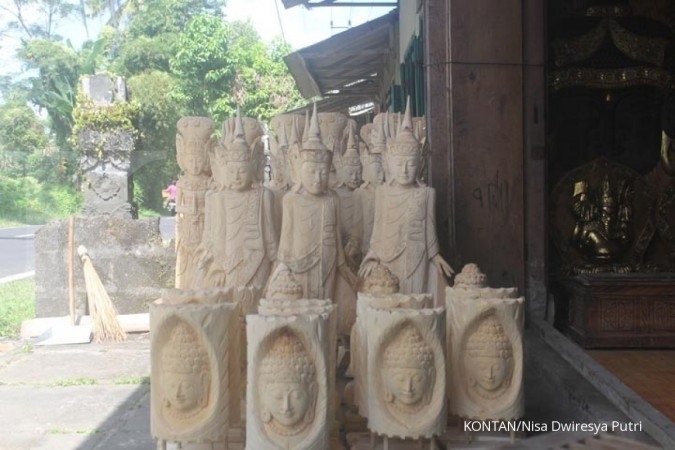 I Gede Nyoman Subadri added that Bali shipped various kinds of sculptures and other souvenirs from wood raw materials worth US $ 4.41 million during October 2017, an increase of US $ 675,402 or 9.25% compared to the previous month at US $ 3.73 million. However, compared to the same month of the previous year, this exports plunged US $ 347,758 or 18.07%, considering the shipment of various types of sculpture in October 2016 that earned foreign exchange of US $ 4.76 million. I Gede Nyoman Subadri explained that the sculpture and various types of souvenirs from wood materials is able to contribute 9.25% of the total exports of this area of ​​US $ 47.69 million in October 2017, an increase of US $ 2.72 million or 6.05 % compared to September 2017 was recorded at US $ 44.97 million. Bali’s total exports compared to the same month in the previous year decreased by US $ 6.08 million, or 11.31%, as October 2016 shipment of various types of sculptures abroad was able to reap foreign exchange of US $ 53.77 million. Sculpture and various types of wood-based souvenirs is one of the five commodities Bali’s mainstay exports. Exports of fish and shrimp that contributed 27.5%, apparel products not knitted 12.99%, jewelry products (gems) 12.68%, and furniture products, home lighting 7.65%.